Home > Pumpkin Carving Contest Winners 2015 > Is This An Orc? The Shading and Perspective Are Amazing! I apologize that I don't know the difference between an Ogre and an Orc or anything like that. I played D&D twice in middle school, but back then we didn't have such detailed imagery. Either way, this is likely the best example of a shaded carving that I have ever seen. I especially enjoy the perspective. 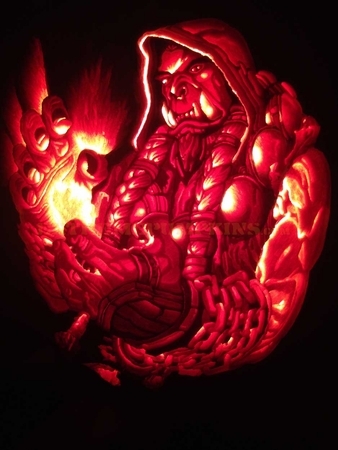 It's a great carving.